Television and the horror genre have had a long-standing relationship throughout the years. While just about any horror fan can recall watching late-night horror slots featuring classic (and not so classic) theatrical features, television has also been a haven for original work. Such work has ranged from television series such as The Twilight Zone, Dark Shadows, and the more recent Fear Itself to full-fledged feature films such as Duel, Salem's Lot, and Dark Night of the Scarecrow. Of course, these efforts represent some of the best television has had to offer, leaving hundreds of other films languishing in relative obscurity. 1972's Crawlspace is an example of such a forgotten film, as the movie was likely rarely seen after it aired in Feburary of that year. Not to be confused by the 1986 film of the same name (and starring Klaus Kinski), this Crawlspace is a low-key, character driven film concerned with the plight of Alice and Albert Graves, a childless elderly couple. As the film opens, the two have been having trouble with their house's basement; a local repair service send out a young man named Richard to repair the problem. The two invite Richard to stay and eat after his work is done, and he seems to be a normal, friendly young man. Things become a little awkward in the next few days, however, as the couple discovers that Richard has taken up residence in the crawlspace below their house. Their bizarre tenant is initially reserved and withdrawn, but he soon begins to exhibit violent behavior as he grows more and more attached to his surrogate parents. Crawlspace is a decent little low-rent, no-budget shocker. While it obviously has its drawbacks due to its status as a made-for-television film, it makes the most of what it does have, which is decent acting, competent direction, and a tense, moody atmosphere. With such a small cast and focused story, there's ample time to develop the Graves and Richard into decent characters, and the film succeeds for the most part in this respect. Teresa Wright's performance as Alice particularly exhibits a lot of range, as she degenerates from a woman desperate for a child to outright wanting Richard dead by the end of the film. Tom Happer is appropriately creepy in the role of Richard, as he's able to subtly portray the character's offbeat qualities without resorting to a generic manic performance. There's also a dimension of sympathy to the character, as he essentially just wants a place to belong after being shunned by society for so long. Thus, most of the film's horror is found in watching everything fall apart around Richard and the Graves family, as the former finds difficulty in reintegrating himself into society. For example, Richard is tormented even on the most routine trip to the grocery store, which results in him completely ransacking said store, leaving Mr. Graves to inexplicably cover for him. 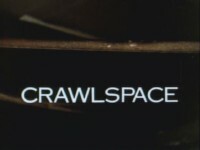 As the film progresses, Richard becomes increasingly violent and withdrawn, and makes reference to the crawlspace being the only safe place for him in the entire world. There's something a bit unsettling about the whole situation, and the film's gloomy atmosphere and mood suit it perfectly. Crawlspace has that strange, low-key, somber 70's vibe reminiscent of Silent Night, Bloody Night and the original Black Christmas, perhaps because most of the film takes place during the winter. The nearby surrounding forests are perpetually barren and the skies generally gray and overcast, and it makes for quite a haunting and almost surreal setting. Finally, the film's piano-driven score adds some creepy ambiance to the proceedings. 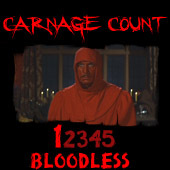 Otherwise, the film is of course bloodless given its made-for-TV status, though there are a few violent moments towards the end of the film. For the most part, the film relies on being creepy rather than loud and shocking, and it works for the most part. That said, the film has its share of drawbacks that have nothing to do with budget constraints. Instead, the story itself is a bit weak and falls apart at the end. This is mostly in reference to Richard himself, as the story hints throughout that something is wrong with him. It's speculated early on that he's one of many college students that have dropped out of school and become social outcasts, but that seems entirely too simple for the disturbing behavior he exhibits. In fact, the story seems to hint at a supernatural angle, as if Richard is somehow controlling the Graves and bending them to his will. There's also a throwaway reference to Richard's obsession with God early on in the film, but this is soon dropped altogether. It feels as if the film is leading up to some huge revelation in regards to Richard's character, but it never comes. Instead, the film just ends on a rather somber note and might leave you with more questions than answers. As such, Crawlspace falls short of being a nice little unsung classic. Instead, it's a nice little workman-like effort that can hold a viewer's attention for the duration of its 75 minute run-time. If anything, it's a good concept that could be better executed if revisited in the future with a bigger budget and a more polished script. The film was rescued from obscurity in 2007 when it was released on DVD by Wild Eye Releasing. The disc features a correct 1.33 full-frame transfer that's full of scratches and specks, but it's very watchable. Likewise, the 2.0 soundtrack has some hisses and pops, but it's otherwise a clear, intelligible track that gets the job done. There's no special features, but I'm not so sure anyone ever expected any for such an obscure film. Unfortunately, this release is out of print and a bit expensive on the secondary market, especially considering that the film's quality doesn't exactly warrant the prices. It can still be found on some online rental services such as Netflix, which will more than suffice. Rent it!